All pupils meet some problems in learning. 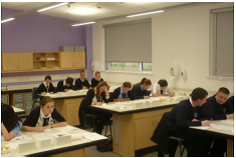 In the main, these problems are tackled by the subject departments who work to ensure that the curriculum offered can be understood by all pupils. They may do this perhaps by offering different material, or different teaching approaches to those pupils having difficulty. Language and learning are very closely linked and for this reason, every department is asked to have a language policy. This helps them to highlight areas of possible difficulty and how they intend to overcome the likely problems. New words, for example, may have to be shown in a consistent way, perhaps by the use of posters around the room. How work is corrected is displayed for all teachers and pupils to see. (1) initial identification of a need, through (2) a stage of specific planning by the classroom teacher, (3) planning of an individualised education programme (IEP) if necessary, to (4) a Coordinated Support Plan (CSP) where the child’s needs require to be met by a range of agencies. One of the main duties of the Learning Support Department is to advise and assist other departments, as they teach their subjects in a way which will be suitable for pupils who may have additional support needs. Help for pupils with learning difficulties also comes from using Learning Support staff in classrooms. This happens regularly in English and Maths classes as well as in other areas of the curriculum. In this way, pupils having difficulty have more opportunity to have extra help with the work of the class. Pupils who need more individual attention for help with basic language may be taken out of the classroom for a language programme over a specific number of weeks.These children will be taught through a programme of work devised by the Learning Support Specialist. We vary the arrangement regularly to ensure that no one subject is missed too often. Special help can be given, by a Network Support teacher, to pupils who have specific problems, such as dyslexic difficulties. If a child’s problems are more serious and perhaps long term, we can approach the PsychologicalService for their specialised expertise. There are a number of schemes running for short blocks of time, which offer support to groups of pupils. The Social Skills Group is aimed at pupils whose behaviour may be reticent, boisterous or simply individual, and who are having some problems settling into Notre Dame. The Reading Workshop is run by Network Support with additional support staff, and encourages pupils to enjoy reading activities through the use of attractive books and group language games. The Paired Reading Scheme brings S1 pupils together with senior pupils who act as tutors in a one-to-one situation. Behaviour Support is offered by specialist staff, specifically to address problems of a behavioural or emotional nature. Pupils are counselled, often daily, and set targets for the short term. By the time pupils reach the stage of certificate examinations, the special strategies which have been needed in their classes can usually be given in the form of Special Arrangements. This is intended only to allow the pupil to show what they have actually learned. Some pupils, for example, can be allowed to have a scribe to record their answers on paper, while others may be given extra time. The Stella Maris Base is a recent addition to the school and provides support for identified young people diagnosed with Autistic Spectrum Disorder (ASD). The base takes a maximum of five students each session and supports them in accessing mainstream education in Notre Dame High School. The CLB has three teachers and four ASN Support Assistants who work closely with the young people and class teachers primarily in the classroom setting. Placement in the CLB is a decision of Inverclyde’s ASN Monitoring Forum.